Roasted red chile dulce (bell pepper) is delicious with anchovies. It’s one of my favorite dishes. I discovered it when I was living in Manhattan, working at CBS news. It was a common appetizer in many Italian-inspired cafes that stay open ’til 3 am. In Texas very few restaurants serve it, so on the rare occasion when I see it on the menu, I always order it. In Mexico, anchovies, anchoas, are sometiemes called charales because both are small and they look alike. Mexican Charales (scientific name, Chirostoma) are native to Mexico and are served either fresh or dried (salted). A popular snack, they are eaten straight, heads removed, with a variety of salsas. They are also fried for tacos or breaded to form patties and even featured in tamales. They are delicious paired with nopalitos, cactus, and they are sometimes cooked with scrambled eggs. 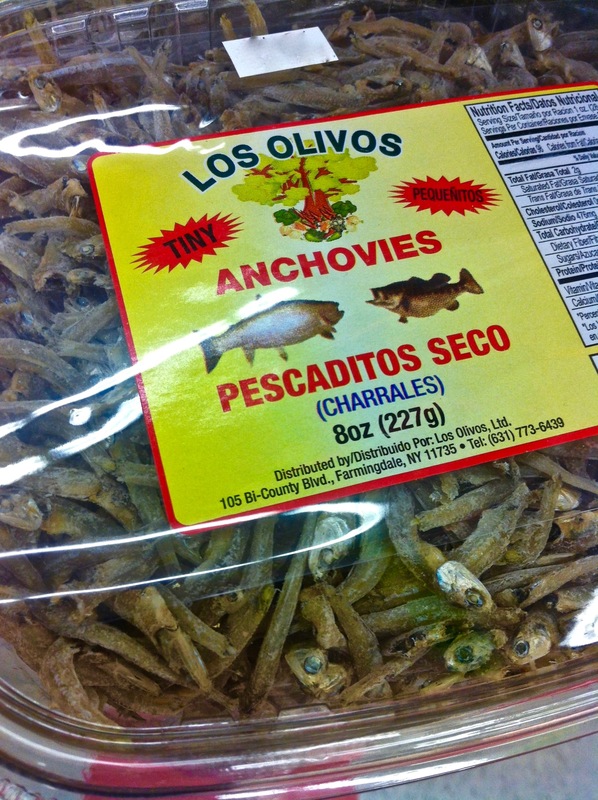 Anchovies, anchoas (scientific name Engraulidae), are native to the Pacific, all the way from Spain and France to the coasts of Peru and Chile. They’re also found in the northern regions of the Atlantic. They are served brined or in vinegar. I suspect that most US folk who say they don’t like anchovies probably have never had good quality, properly brined and prepared anchovies. 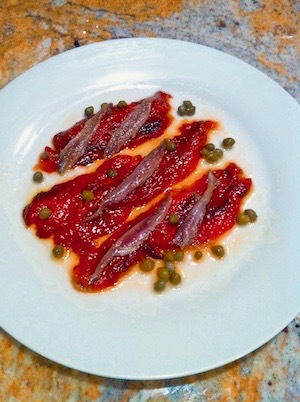 Red bell peppers paired with anchovies is a classic Tapas in Spain. In Italy they are also a classic treat. And in the USA it appears on menus from time to time. As I said, I always order it. It’s not only delicious but it also makes me feel global because it is a clear reminder of how all food is eventually global. This dish is rooted in Mexico but with the olive oil and capers, it has the spirit of Italy and Spain. The bell pepper chile is native to Mexico and was taken to Spain and Italy by Columbus. Because its flavor is mild, the attractive chile quickly became popular in Europe. Besides, it was easy to cultivate. 2. Remove from the oven and cover with a wet cloth, or you can place them in a paper bag, closed tightly. The steam will help peel off the skin later when they cool. 3. When cool enough to handle, peel off the skin and make a slit, lengthwise and remove all the seeds. Use the edge of a knife to lightly scrape as needed. Slice the cleaned chiles into 2″ strips. 4. In a sauté pan add the olive oil and the sliced garlic and heat through. Then add the chiles, salt, and heat for about 5 minutes to allow the garlic flavor to soak in a bit. 5. Let the chiles cool down and then you can hold them in the fridge for several days if you’ll be serving them later. 6. As you see in the pic, place slices of the red bell pepper on a plate including the olive oil, then lay some of the anchovies on top. Sprinkle with capers and serve immediately. I don’t add the sliced garlic to the plate but you can if you like. It can be delicious.